Over here at Team Wufoo, we make it a priority to listen to you, understand your needs, and deliver capabilities to make it easier for you to accomplish your goals. This starts with our great customer support team and continues on down to our product and engineering teams. However, we feel we can do a better job to engage with you—that’s why we’ve implemented a new feature named (drumroll please)… Feedback! 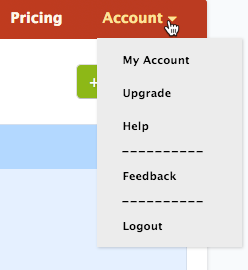 You’ll find Feedback under the Account menu. It’s very easy to use—in fact, we’d love if you would use Feedback at your next login to let us know what you think! The goal is very simple: we know you have a ton of things to do and have great ideas on how we can help you do them. So we made an easy way to help you send your ideas to us. You can also vote on features other customers have proposed to help us know which ones we should be working on. Once you select Feedback, a new window will appear where you can browse features that other customers have suggested, vote on any of the ones that you like, suggest your own ideas or—if you happen to run into one—report a bug you’ve encountered. We tried to keep the interface as simple as possible because we know you have a lot going on. You can search for an idea to see if others have suggested something similar, or display ideas that are most recent or most popular so you can add your vote. The Wufoo team will use this information to help guide what new features and functionality are being put into our roadmap. FYI: we may have some follow-up questions for you regarding the requested capability to ensure we understand how the feature should behave. That’s about it! We look forward to hearing your ideas and feedback. Hi there, I am a new customer and I want to create a form that forces customers to fill in every field, so none are left blank, but then I want to add a section at the end so that if they print the form they can sign and date it, as some of our customers do things the old school way. Can you help? thanks. Posted November 2nd, 2017 by Niamh. You can use our Required Fields to make sure everyone fills out all fields. To allow signatures on printed forms, you could try our Lagoon theme. This theme has a single line rather than a input box, and may work great for you! Posted November 2nd, 2017 by Cody Curry. Would really like the ability to organize the forms on the back end as we need them. Also, if there was a way that applicants could save their forms and work on them later, this would be helpful. Posted November 2nd, 2017 by Heather. I’ve been waiting for Folders for years now. It would be the most useful feature for us. I know many other people request it. It’s frustrating that you develop all these things like pagination whereas folders would be much more useful to many of us. Posted November 2nd, 2017 by ines. An import from WordPress feature would be nice. Posted November 2nd, 2017 by london weddings. Posted November 2nd, 2017 by Eric Musso.